BedBugCover.com - Contact Us - Control and Prevent Bed Bugs, Allergens, and Dust Mites....Comfortably! or e-mail us for institutional pricing. Please contact us with any comments or questions at the following number or through our email form provided below. BedBugCover.com c/o Boston Textile Company, Inc. Arrives Next Business Day to NY, NJ, MA, CT! 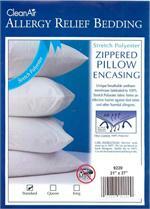 * Due to the FedEx "dimensional weight" cost method, shipping charges are applied to all orders that include pillows.